Searching per se doesn’t have ethical force, however, it can help you to make a better choice, as a consumer, acting, behaving and voting. 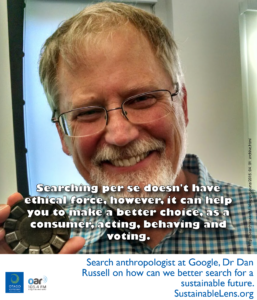 Dr Daniel Russell is a research scientist at Google where has been working in the area of search quality, with a focus on understanding what makes Google users happy, skilled and competent in their use of web search. As a “search anthropologist” he works to understand how people use the tools of technology to amplify their intelligence. So, the big question for the expert in search, how can we better search for a sustainable future? In searching for this positive future we first consider the role of questions in operational aspects (eg how we can better find information on positioning solar panels), and behaviour change (should I take the bike to work today? ), then moving onto the harder questions of sustainability, values, wicked problems, contested concepts, answering ethical dilemmas expanded in space and time and so on. This conversation was recorded at CHI2016, where Dan was co-chair the CHI4Good programme. The paradox is that the simplest things are the hardest to design – the things that seem straight-forward and obvious are often not. Helping to teach the world to become better searchers. Should is always “with respect to…”. The big shift, as we get better at machine learning, we’ll get better at interpreting questions. But “should”, that’s a tough one. (Contested concepts – will we see answers to climate change in the same way we currently see movie listings?) Even things like stream flow rates can suddenly become contested. The choice to put it on the homepage is only for pretty clear topics. (Who is deciding that clarity? Machine or people?) Great question…machine. (Does Google have expectations of journalistic integrity?) We do our best to have an objective ranking function…we do not consider political intent or perspective. Rise of availability of information combined with ability to find it. You now have a chance of finding out. (Restorative socio-ecological transformation, what will be search’s contribution?) Helping people find out what is going on, discovering underlying causes. To discover that the aquifers are well managed is a straightforward search. To discover that they are not is a more complex search – not for the least because there are people that don’t want you to know that. But at least now you have half a chance. You can, through Google, access many more information sources than you possibly could before. This is transforming. For sustainability, for making responsible ecologically valid choices. Now you can find out. Is the truth drowning in the swamp of information? It is incumbent on you as the information consumer to be able to distinguish between publishers. That’s why I teach people how to search. One of the fundamental skills is how to discriminate information. Searching for a positive future. There’s nothing intuitive about this. My big message is it’s easy to search, but it’s easy to get it wrong as well. Let me show you some skills that will make you a better, more accurate, more powerful searcher. (Superpower:) The ability to teach. What I mean is teaching – a grand a glorious profession, but as a superhero powerful teacher would be someone that can communicate complex ideas easily and efficiently and help you understand what that has to do with your life. Its relatively straightforward to teach someone how to do, say, calculus. But how do you teach judgement, how do you teach that skill of assessment? A hero teacher would be someone who could come in and say ‘the world is big and complicated, there’s all sorts of trade offs, there’s stuff going on…let me show you, let me work with you to help you understand how to be a reasonable interpreter of what you see going on in the world so that you can get at the bottom of it. Judgement requires that you have a bit of self knowledge. You have to understand why am I making this choice in this particular way. (Success) Mooc. I’ve had 2.8 million students taking my class – teaching people how to do this kind of search. (Activist) I am active in local things – local politics, local sustainability, local Sierra Club. I’m not a trans-national activist. I think as I get older I might become that. There’s also an interesting distinction between what the corporation does and what individuals do. Google as an organisation is very environmentally conscious. (Motivation) It sounds trite, but teaching people to do this stuff really does. Communicate ideas…what we’ve been talking about, this is my passion, this is what motivates me. And music, and running, and being out in the world, diving. If I was to be a transnational activist, it would be about coral reefs, ocean acidification and so on. That motivates me in a negative way – it makes me sad and I want to fix it. (Challenges) Packaging up a lot of these experiences and skills…a book. (Advice) be a discriminating consumer of knowledge that you find.